and so I thought it’d make sense to try and write up some early impressions of what has been newly announced at the //Build conference today around the convergence of Windows/Phone 8.1. 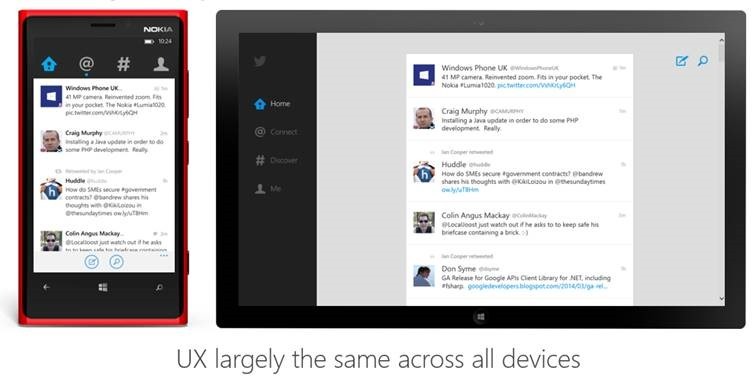 It’s an update to existing Windows Phone 8 users and will come pre-installed on new phones. It runs existing apps/games that are running on 8.0 today. There’s lots of new end-user functionality that I’m not going to attempt to go into here – see the post referenced above. A developer can continue to work on their 8.0 app/game and re-publish new versions to the Store in the confidence that the app will continue to work on all 8.0 and 8.1 devices. A developer can choose to build an 8.1 app/game (possibly by upgrading their existing code) and take advantage of the new UI layers, runtimes and APIs that 8.1 brings to them. 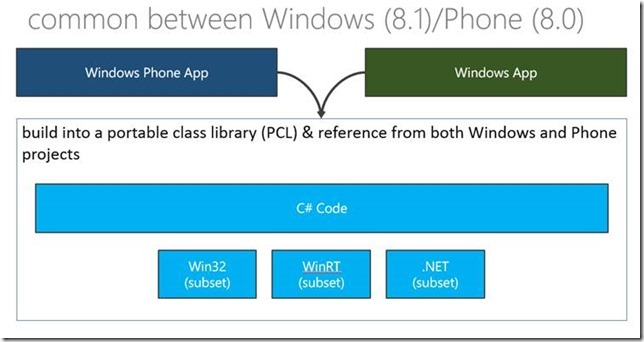 Before delving into any more details though, I’d like to take a little bit of time to talk about where we are today which perhaps sets the scene for what Windows Phone 8.1 brings to a developer that wants to “Build for Both” Windows and Phone. Note – in the discussion below I largely focus on “app” platforms rather than “games” platforms but that’s mostly because the games platforms are already somewhat more unified and also to try and keep what’s already going to be a long article down to a smaller size. Also, I focus on .NET technologies in the discussion below. There’s another discussion that could be had around HTML/JS technologies. 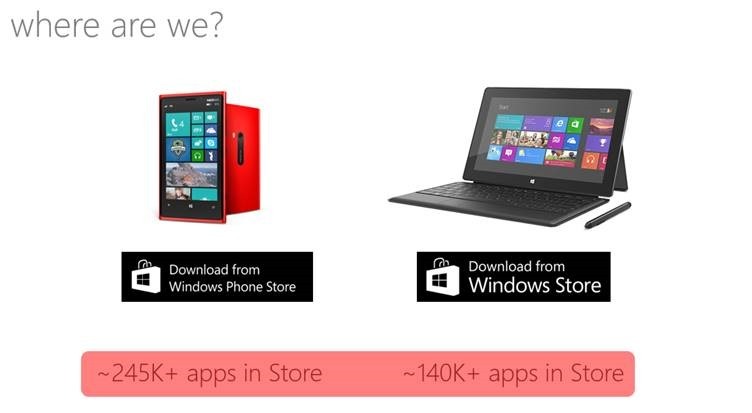 Those numbers come from the “Microsoft by the Numbers” site and I think they’d be something of a surprise to someone who was completely fresh to the state of play on Windows/Phone. 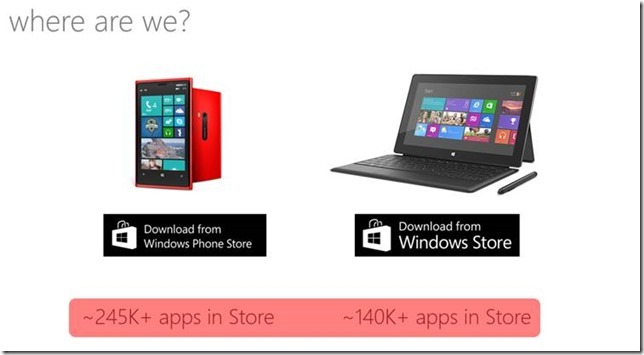 The Windows Store hasn’t been around as long as the Windows Phone Store. Developers typically think of “phone” devices when they think of developing for “mobile” rather than thinking of “tablet/laptop/all-in-one” platforms. I take that from the “State of the Developer Nation” report which says that only 12% of developers think of non-phone devices (e.g. tablets) when they first develop an app. 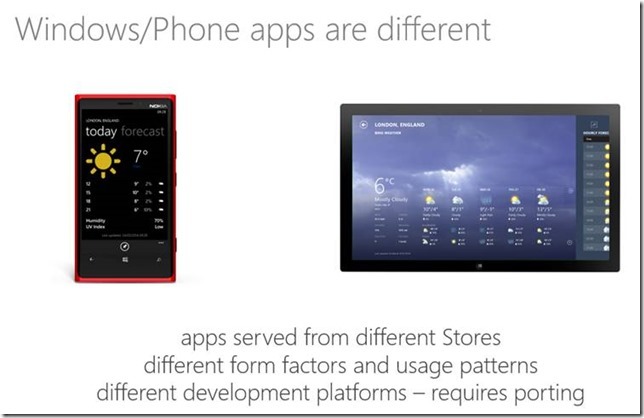 There’s two reasons there – one is that phone apps and other apps are used differently and the other is that there are differences in the development platforms between Windows/Phone which means that a developer has to do work in order to get an app onto both. Personally, my phone is used very differently from my tablet. My phone is pretty much always with me. It’s always turned on. I don’t like having to charge it but I’ll accept it maybe once a day or a little more if I’ve been using it intensively. My tablet’s very different. It rarely leaves my house. I turn it on and off a lot. I care about the battery but I can accept when I have to charge it. Again, my laptop’s different too. I mostly plug it in. I never, ever take it out and hold it in my hand in the street. I connect it to a wide variety of hardware (e.g. mice, printers, scanners) that I would never expect to be able to plug into my phone (which is interesting because the same underlying Windows code OS could make that possible). I’d argue that the user experience here is largely the same across the Phone and the tablet/laptop/all-in-one devices. There’s some slight difference perhaps in the way that the command options are placed and maybe in the way that you can compose a tweet but, for me, this official Twitter app seems to have taken the approach of ironing out the differences across the form factors. 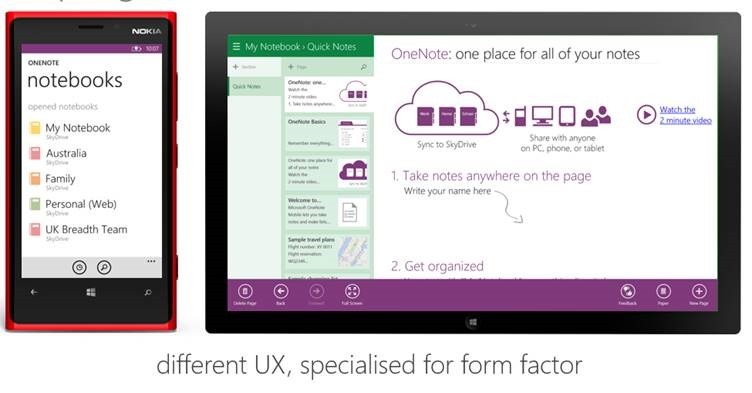 The way that I use OneNote on my phone is completely different from the way that I use it on a tablet or a laptop and the user experience is (to me) quite different. On the Phone I rarely take notes beyond a couple of short bullet points but I do like to be able to open up notes and refer to them. However, I’d never expect to grab a piece of text and start dragging it around the screen and doing fancy reformatting on it. On my laptop, that’s exactly what I expect to do – I need the full productivity that having a mouse, keyboard, touch and pen can give me and I want to make use of all the real-estate of the landscape screen to get stuff done. I don’t think there’s a “right answer” here – I suspect that a lot of apps will present different UX on a Phone than they do on a tablet/laptop and, in some cases, apps may only be suitable for one form factor and not another although, clearly, we get into something of a grey area when we think about phones that are pretty much tablet-sized at 6” and tablets that are pretty much phone-sized at 8”. Anyone’s who been working with Windows/Phone for a little while will know only too well that in the current Windows 8.1/Windows Phone 8.0 incarnations there are quite big platform differences between the two. There’s a UI layer here that I’ve called “Silverlight XAML” because it’s Silverlight that does the rendering on Windows Phone 8.0. That UI might be created in XAML or it might be created in code but it’s using the controls etc. that the layer provides. 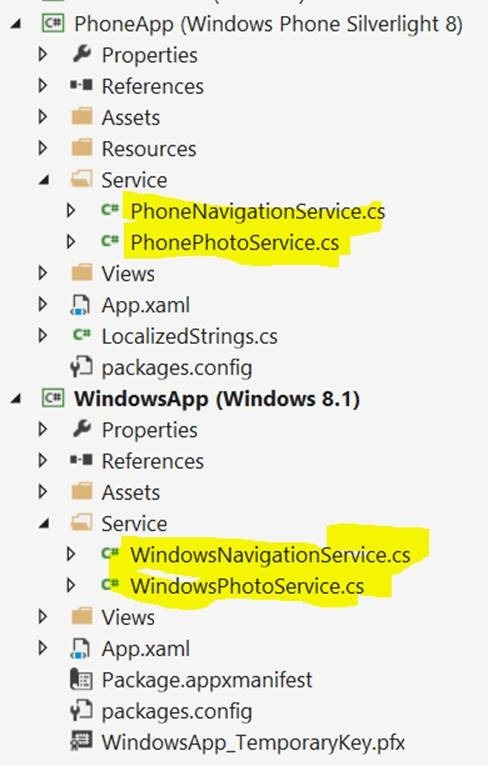 An app then has some code that somehow links in to that UI layer and makes calls down into the platform APIs below. 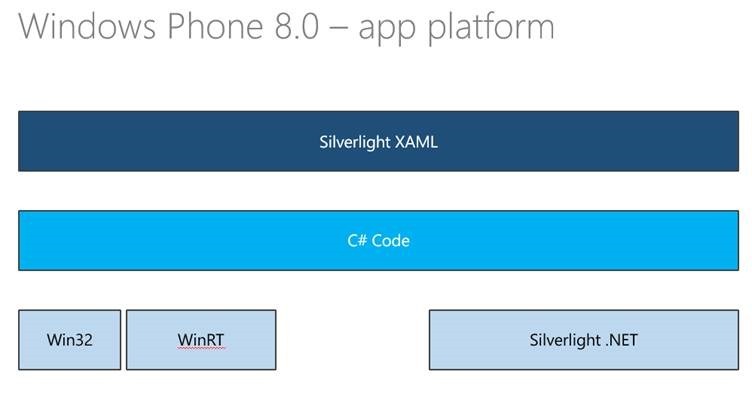 The primary API for a Windows Phone 8.0 app today is what I’ve called “Silverlight .NET” which is a subset/superset of .NET framework specifically for building Phone apps. It’s also possible to call into a small set of the WinRT APIs from Windows 8.1 and a small subset of Win32 APIs via platform invocation. 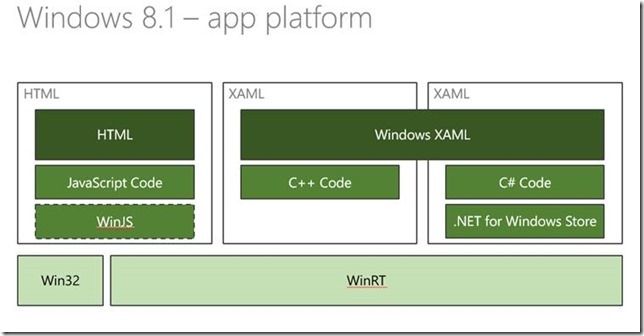 Underlying that code, the platform API set is really WinRT. It’s WinRT that pretty much provides everything the developer uses from accessing the file system to the camera or the network. 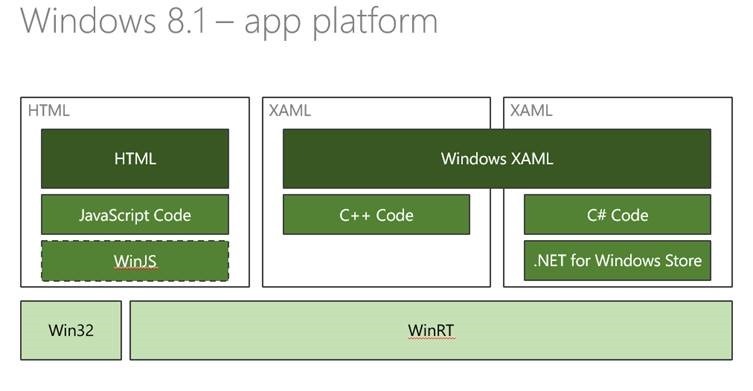 There are also a small number of Win32 APIs available to the developer but most developers don’t need to make use of them. 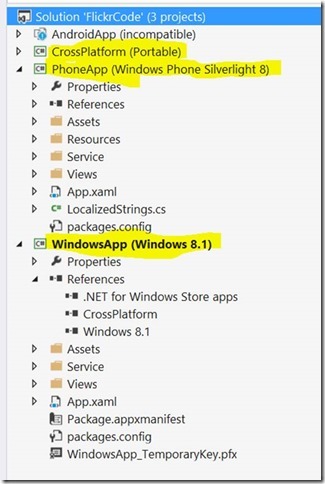 A .NET developer can build a portable class library which can be used on both Windows 8.1/Phone 8.0 but that developer is somewhat limited in that the code which can be built into that library can only make reference to the subset of APIs that is truly common across both platforms and this is a small subset. What that means is that, for example, a portable class library like that can’t contain code which makes API calls to access the camera or to update the application’s tile. That makes portable code only useful in the context of being provided with quite a lot of abstraction. 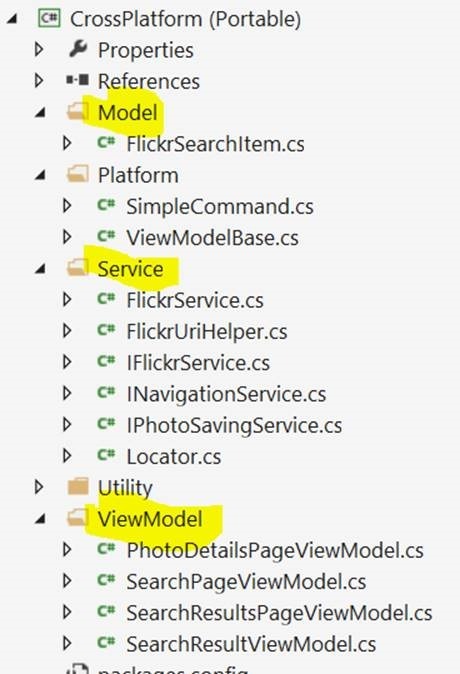 Developers working with a pattern such as “Model View ViewModel” (MVVM) are relatively well placed to code their way around this by building different Views (UI) for Windows/Phone and ensuring that those views are not tightly coupled to the classes that support them (ViewModels) by generally only linking those two entities together by declarative data-binding statements. 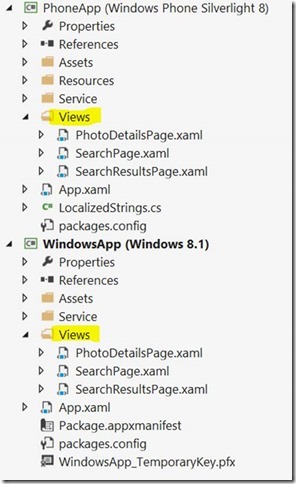 ViewModels are generally in the business of “presenting Models” and it’s possible with this sort of approach to build a portable class library that contains ViewModels, Models and any other portable algorithms and so on that don’t need to differ across Windows/Phone. With a little bit of additional bootstrapping code, it’s possible to use techniques such as inversion of control and dependency injection to inject platform-specific service implementations at runtime. In the diagram above, these are the services represented at the bottom left and right of the diagram respectively. 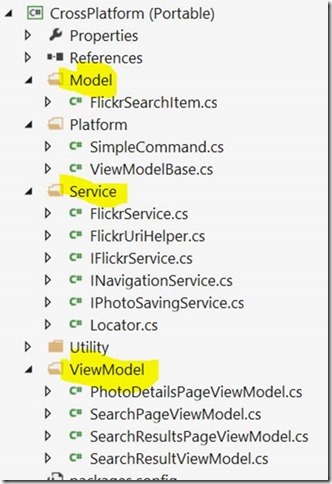 A service to navigate from one View/ViewModel to another (INavigationService). Of those 3 services, the flickR service can be written portably as it simply uses a portable class (HttpClient) to reach across the network, talk to flickR and deserialize JSON data (using the portable JSON.NET library). 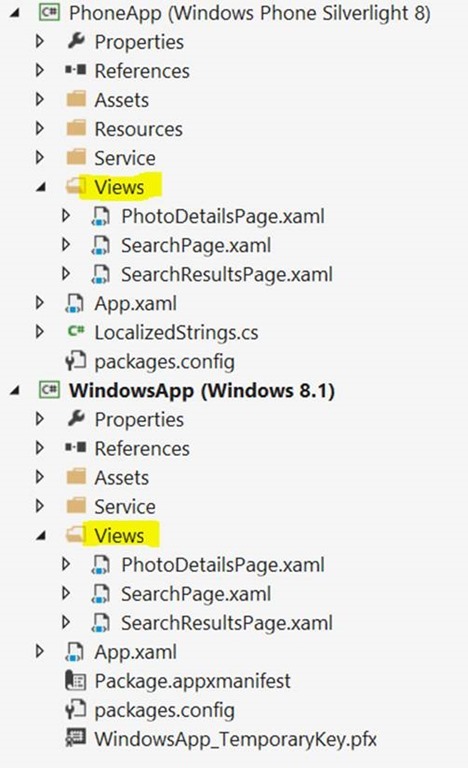 and a “locator” class (referenced by the DataContext binding in the previous XAML snippet) is responsible for creating an instance of this ViewModel when required to by the View and resolving all 3 dependent services for the ViewModel using an IoC container. 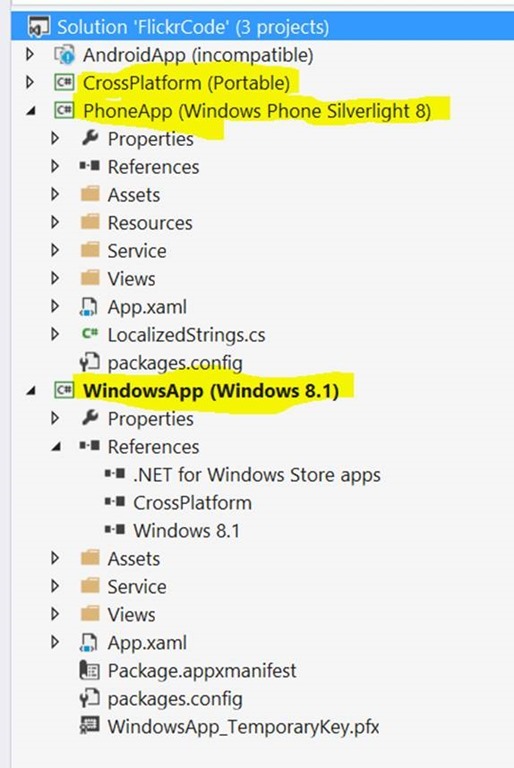 With that in place, it is simple enough to bootstrap the IoC container with platform specific code such that it provides one set of services on Windows 8.1 and another set of services on Windows Phone 8.0 and then resolves types correctly to use the particular set of services for that platform. 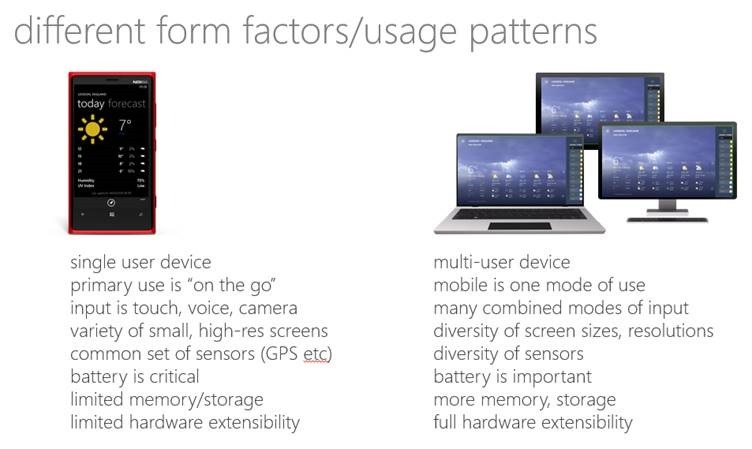 so that it’s then possible to talk about what I think Windows Phone 8.1 changes which is that second point. 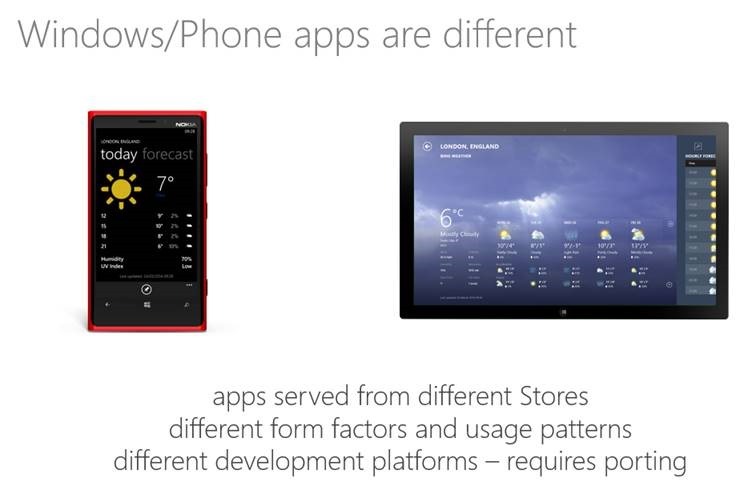 I think that we are going to continue to have to think about Phones and other devices differently to a certain extent but I think that the Windows/Phone 8.1 platform changes announced today largely take away that second barrier of the platforms having differences. 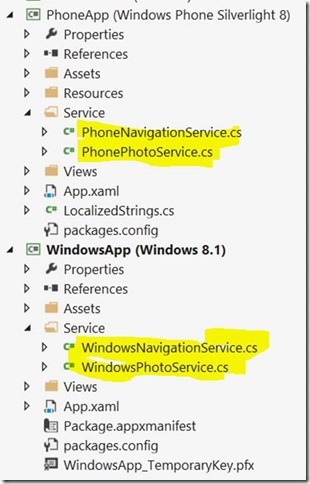 What does Windows Phone 8.1 bring? I’ll get to that in the next post.